Where should I start? These have been two good knitting days. Yesterday we had the regular Leppävaara knitting meet-up. Yes, that was just after the meet-up in Helsinki, but the Helsinki meet-up was delayed by one week because the real day was the Twelfth Day/Epiphany. 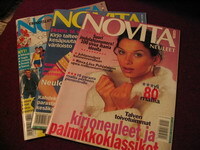 I got some old Novita magazines from Carita. Thank you so much! On the way home I went to the post office to pick up a parcel and to send the gift to my Nordic Secret Pal. Watch out, it could be you! I got two books... 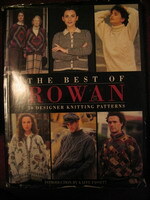 But before I introduce those, I'll tell you that I finally got The Best of Rowan book (1998) today. I had ordered it in November! The book, well, you know what I'm going to say. Intarsia, loose fit, blah blah blah, the book is another good source for inspiration. I liked a sweater with some creatures (I saw the picture on the first pages) and thought I could borrow something from the pattern. I did encounter the harsh reality of ordering used books, though: someone had neatly cut off two pages and a piece of the third page. Yes, the pattern for my sweater was gone! Then to the other, new books. is written by Priscilla A. Gibson-Roberts and Deborah Robson. It was first published in 1985, sold out, and revised and republished in 2004. The 2004 edition is an extended edition. Sounds good, doesn't it? The book is good. It introduces traditional sweaters from Scandinavia, the rest of Europe and the Americas and tells how to design your own sweater in different shapes by using the percentage method. There are no (colour) photos in the book and the pictures of the sweaters are drawn by hand. However, the book contains so much useful information on so many things that I only have one question in mind: Why oh why did I not buy this book earlier? by Joyce Williams is another great book. Yes, the author has never been to Latvia and on the cover there are two people who show the Latvian spirit by holding a birch log together... If you liked Norsk Strikkedesign, you'll like this book, too. The sweaters are based on Latvian weaving patterns and they are colourful and intricate. Also, there are matching pairs of socks for many sweaters! 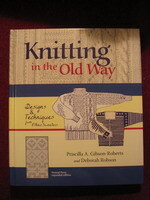 I quickly browsed through this book: fairisle, talk about Elisabeth Zimmermann, fairisle, fairisle... Wait, is that it? No, that was not all, after the 12 designs (socks not included in that number) there are about 40 pages of small and large charts and information on how to design your own sweater! So, I accidentally managed to order two books whose theoretical parts somewhat overlap. I do warmly recommend both books. Thank you for your note! I already have Nordic Knitting and Knitting in the Nordic Tradition...also Knitting in the Old Way, as I already mentioned. I would never be able to read the patterns in Finnish; I was hoping there might be an English translation. I will get by with these books, but if you can think of anything traditional Finnish patterns/designs that is written in English, please email and let me know. Caroline, I'll e-mail you later if I can think of any books, I'll answer here now in case someone else wonders about the same thing. I would recommend a book called Sydämenlämmittäjä ja tikkuripaita by Mirja Almay, Marketta Luutonen and Kyllikki Mitronen. As you can guess, it's in Finnish. I don't know if it's available anywhere anymore, it was published in 1993. Susanne Pagoldh has written the book Nordic Knitting (thirty-one patterns in Nordic tradition) and it was translated into English in 1991. This book has all kinds of Scandinavian designs, also some Finnish ones. Also, if you find Knitting in the Nordic Tradition by Vibeke Lind, you could take a look at that book as well, there are some Finnish sweaters as well. 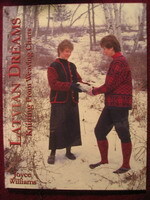 I'm looking for a good book of traditional Finnish knitting patterns/designs which has lead me to your wonderful blog! Is there such a book that you can recommend and also tell me where I can order this? Please feel free to email me with your response as I'm sure I'll get it faster that way. Thank you! Some of the weaving patterns are used as such, some are enlarged and used as one large motif. There are lovely colour combinations and great ideas. I love this book!